A great collection of tasty recipes. One of my many favourites from this book. A must make! Made several times over the last few years to take to events. Extremely easy to make and always appreciated by friends and family. They are really nice. I wasn’t expecting much of a reception from my family with this dish, but they all gave glowing verdicts. On the table in 30 mins, this was very easy & very tasty. Great side dish with roast chicken. I reduced the amount of stock so that it glazed faster. Well what can I say ...this is truly truly tasty- a dinner party splendor.My husband cooks this in his paella pan and when brought to the table gets everyone salivating. A great recipe. We love this in our family. We don't always add the spinach in- just depends if we have it around. Great for when courgettes are plentiful. Again husband likes to make this. Whilst I loved this, unfortunately it won't be on high rotation as this opinion wasn't shared by the rest of my family. There is a whole lot going on, but I thought the flavours well complemented each other. I can't wait to be home alone to have this again! This is delicious. It works in the oven, although you don't get the deep char of the picture. If you're not a fan of rosewater, halve the amount. I used 2 tablespoons of oil instead of 100ml and this was still amazing. Theses are so simple to make and so tasty. I have made them many times. I usually cook for longer with the lid off to really brown them before serving. Very quick & really tasty. Used a jumbo muffin tin, which made 6x pies, with the cooking time actually unchanged. Did made half with goat cheese & half with blue cheese. 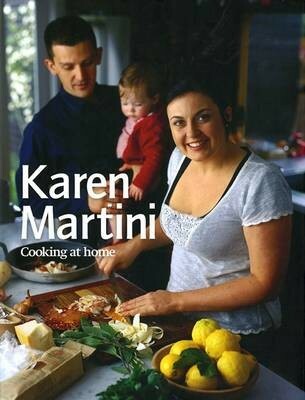 As usual, Karen Martini does not let me down. This would have to be the best pea and ham soup recipe I have made, and I have made a lot! The addition of the tomatoes, barley and fresh herbs make all the difference. I also used a free range smoked ham hock which added to the flavour. True stick-to-your-ribs fare. Really tasty & really filling, a real meal in itself. Yum. Used this as a last minute back-up when another pork marinade dish failed miserably. This was ok, but nothing too much more than that. Despite the ingredients, the flavours didn't really shine. I only made the mandarin ice cream. It's tangy, delicious and has a really great texture. I found taking to the mandarins with a peeler too difficult so I used a micro plane and used the zest from 10. I always use an oven thermometer & this took closer to 40 mins to cook, rather than the 25 mins in the recipe. Very easy to whip up, with seconds had by all! Very nice cake with a lovely soft crumb & an interesting flavour combination of pine nuts & rosemary within this dessert. Since having her first child, Karen Martini has spent a lot more time contemplating the eternal question of what to have for dinner. No longer able to pop out to a restaurant at a moment's notice or to the shops to pick up a basketful of exotic ingredients, Karen has created a repertoire of dishes that can be put together quickly and simply, but with great effect. Karen loves cooking traditional food - be it Mediterranean, Middle Eastern or comforting English baking - but adds something extra to make it look and taste special: kibbeh, normally made with lamb, is a revelation when ocean trout is used instead; a dollop of smoky eggplant completely transforms a piece of chargrilled tuna; and a classic cheesecake becomes an elegant dessert when paired with a spoonful of wine-soaked berries. Based on Karen's phenomenally popular column in Sunday Life magazine, this collection of 150 recipes, beautifully photographed by Earl Carter, offers the inspiration needed to turn the evening meal into a special occasion, every night of the week.